The rules for claiming Social Security have changed. Find out if you still qualify to “file and suspend” benefits or to choose between your own benefits and spousal benefits before these strategies disappear. 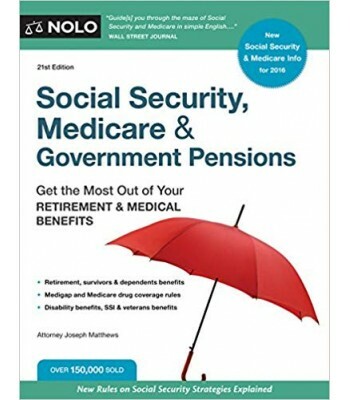 Learn this and more with Social Security, Medicare & Government Pensions―completely updated for 2016. Social Security benefits. 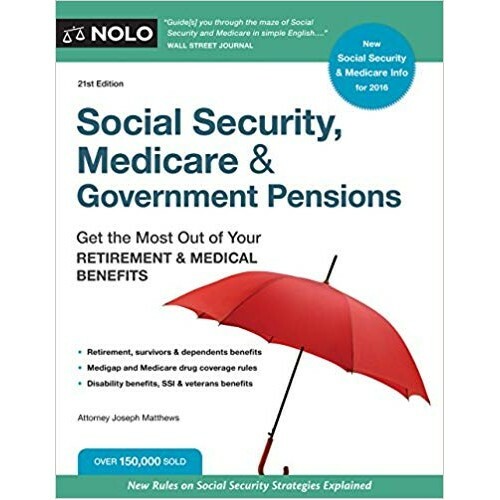 Figure out how to get retirement, disability, dependents and survivors benefits, or Supplemental Security Income (SSI). Decide whether it’s best to claim benefits early, at full retirement age, or not until you turn 70―and how to time your claims so you and your spouse get the best benefits. Medicare & Medicaid. Learn how to qualify for and enroll in both programs, including Medicare Part D drug coverage. Medigap insurance & Medicare Advantage plans. Understand what new Medigap policies are available (and old ones that aren’t), compare Medigap and Medicare Advantage plans, and choose what’s best for you.